Full of Grace and Truth: "She put him on her shoulders and carried him..."
Right after the sanctification of the Church in honor of St. Xenia, in the 6th district of Klin, a woman named Ludmila came to the editorial office of ‘Orthodox Klin’ and told the following story about her father. In 1946, when he was 14 years old, he started working at the brick factory, to work the diesel tractor. He was a tall, strong, muscular fellow. Once they sent him to drive peat from the Golikov marsh to the brickyard on the tractor. Captive Germans loaded the peat. And so, the trailer got stuck in the marsh mud. The next day, my father returned, with Serezha Nikitin from Talizi, on the tractor, taking a cable along to pull the trailer out of the marsh. My father took the cable, put it on the trailer device and stepped on it with his foot — he wanted to get into the cabin. But the tractor driver suddenly took off, the cable got hooked on the caterpillar track, his foot became trapped in a noose, which pulled his leg between the tractor’s body and the track. My father screamed: ‘Serezha, stop!’ but his friend could not hear. While falling, my father struck Sergey on the back with his hand, and only then the tractor stopped and went into reverse. When he took the foot out of the boot, there was a lot of blood inside. The heel was like cotton wool. He told the tractor driver that he would walk home himself, but it was six kilometers to his house in Napurgovo. He made two steps vigorously, and fell. He began to crawl on his hands and knees. It was July, and hot. When he managed to crawl to the road, he went into shock. He lost consciousness from the loss of blood. When he came to, he took off his shirt, wrapped the foot with it, then threw it away. Then he took off his undershirt. He threw that away, too. He lost consciousness again. Whenever he came to, his vision was foggy. Then he came about, and he saw a woman, going toward the city. He called for help, cried, but she became frightened and passed him by. He lost consciousness again. He came to, when someone touched him on the shoulder and he could not believe his eyes: he could see everything around him and he stopped feeling pain. In front of him, there was a small thin elderly woman, a little stooped, in a long black skirt, white kerchief, with a bundle and a cane. She did not say a thing, doing everything silently. She put him on her shoulders and carried him. He was even surprised — how she carried him. But she carried him a little, then motioned that she was tired. My father thought that she was mute. He could not step on one foot, but he did not feel any pain. He motioned to her that she could take the cane in both hands, while he could follow her, by holding onto the cane and hopping after her on one leg. Thus they moved towards Klin, until they met some horse-drawn wagons. They laid him in one, and though it was going toward the village, the woman, motioning, persuaded that wagon to return to Klin, and then the woman disappeared. My father never saw her again. When he was brought to the clinic, 7 hours had passed from the moment that he fell under the tractor’s track. They made a splint, bandaged the foot and kept him in the hospital for 3 months. My father is thankful to that woman to this day. She saved his life; otherwise he would have died from loss of blood. If she had not saved his life, Ludmila would not have been born. And this is what happened later. Once, Ludmila happened to buy the Akathist of Blessed Xenia of Petersburg. 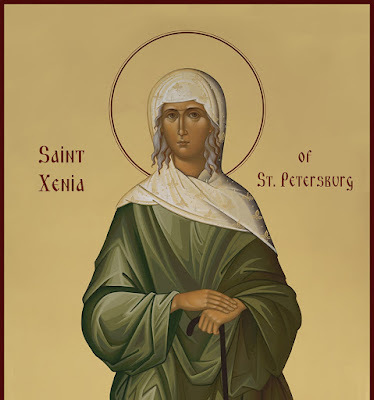 And, by chance, her father saw the image of St. Xenia on its cover. He was amazed to no end. 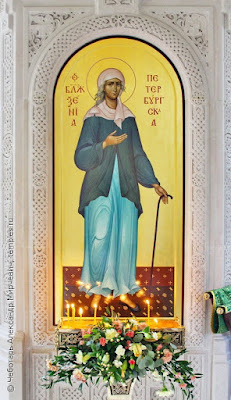 ‘ I, — he said, — visited monasteries and churches all over Russia (he was a bus driver and drove people on excursions, including to sacred places), put candles in front of the icons and asked the Lord to give me a chance to meet that elderly woman and thank her. But I never met her. And here she is, on the picture – it is definitely she.’ Her father realized who had helped him. On the Nativity in 1998 he came to the church of his own volition, stood through the entire service, and kissed the Cross.